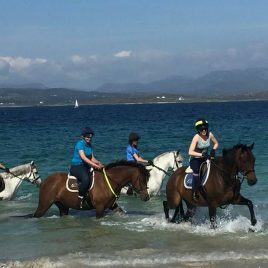 Errislannan Riding Centre and Connemara Pony Stud in Clifden, County Galway offer scenic and historic treks over moors and around the coast, as well as lessons, cross country riding, livery and pony camps. Errislannan Manor Riding School is on Errislannan Peninsula on the west coast of Ireland, four miles (6.5Km) south of Clifden. Follow the coast road towards Ballyconneely, go over 3 bridges, turn up to the right, past the Alcock & Brown Memorial on the hill; one and a half miles (2.5Km) beyond you will see the entrance on the right. Errislannan Manor, home of Stephanie Brooks, is sheltered by a surrounding wood the Manor overlooks a trout lake and is bounded by Connemara’s moors and mountains. It houses the Errislannan Manor Connemara Pony Stud and Riding Centre and is the home of the Connemara Branch of the Irish Pony Club. Many ponies and children have started here. It is also a member of the Royal Horticultural Society Connemara Gardens Trail. Riding and trekking on Connemara ponies takes place by the hour each morning from Monday to Friday inclusive. Please phone to check availability of rides for the date required. When booking certain details will be asked for: number in the party, approximate height and weight of each rider, experience and a contact phone number. Suitable footwear should be worn -i.e. ; shoes or boots with a smooth sole and small heel are unacceptable. We do have a selection of boots for loan.